Jane & Andy Goldman have been directly importing Asian antiques since 1996. 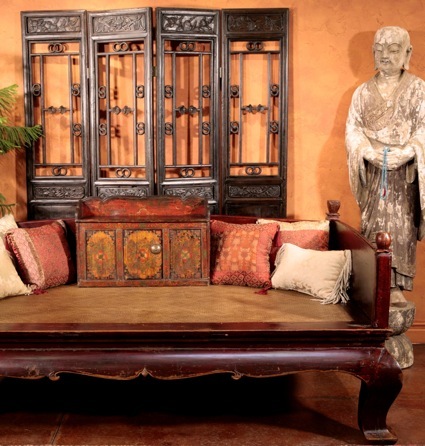 We were one of the first large direct importers of Asian antique furniture in the western United States. We love Asia and are constantly planning trips to new areas to learn about the people, their culture and yes, their antique furniture! We typically travel to China or Tibet once a year and have accumulated a deep background and knowledge of Asian furniture along with a very large inventory of many different styles and types of pieces from all over China, Mongolia and Tibet. Through the years, we have built a rich resource network of over 50 dealers throughout China and Tibet. Our antiques pieces are generally 80-100 years old, and come from many different environments. Authentic antique pieces of furniture can undergo a climatic shock when transferred from a high humidity climate to our semi-arid Southwestern environment. We have developed proprietary methods of preservation and restoration to ensure the safely of all our pieces.